Plateau journalists may have set the standard for the assessment of democratic processes in Nigeria. With their elections which ended in the most peaceful outcomes, the members of the fourth estate appear set to neck politicians on the implementation of Democratic principles where lapses occur. You can't give what you don't have, so the saying goes. This means a father for instance cannot enforce values he does not posses. Journalists are by the virtue of section 22 of the Nigerian constitution expected to check government processes. This they do through routine reportage of government activities, constant scrutiny of polices and programmes as well as analyses, comparing speeches of politicians with what the masses say or what is actually on ground. Journalists become even more effective during elections where they educate the electorates on their rights and duties as well as publicize the programmes of candidates for informed choices. They also supervise the conduct of the polls and ensure the right practices are upheld in the entire process. Where there are irregularities, journalists draw the attention of the public and other relevant bodies thus engendering change. Journalists may have in the past been carrying out these roles without necessarily demonstrating them for others to see how things should be done in the real sense of it. 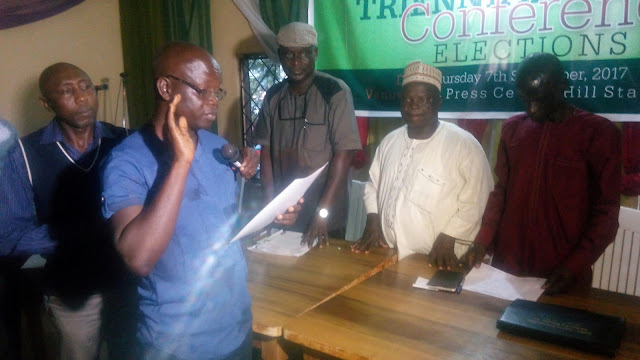 Today however, the conduct of the Plateau state council of the Nigeria Union of Journalists elections serves as a practical exemplification of the values that should be upheld during elections. Aside standing for one another and even applauding one another during campaigns, the candidates in the polls were seen together during the elections freely conversing and laughing with one another. When the elections were over, the Chairmanship aspirants walked into the venue of the announcement of results together and sat together. When the results were announced, the candidate that lost, Iliya Amos was first to stand up, clapping for his opponent, Paul Jatau who won. In fact, he hugged him instantly and congratulated him before anyone could. Putmang Iliya Amos had day before the polls said it was merely a "brotherly thing" and therefore there was no need for desperation. He had even pledged to work with his opponent whether he won or lost. Amos was perhaps the loser but the man of the day who was eventually celebrated by the national NUJ Trustee member at the poll venue, Katdapba Gobum. Another aspirant for the post of Assistant Secretary, Ralph Madugu who lost to Jabbe Detawo was quick to congratulate his opponent. Not only did he congratulate him verbally, he equally wrote a congratulatory note to all the winners and shared it on social media. "It is the Lord's doing," was all he said after the polls with a cheerful look on his face. Murtala Hashim who lost the bid for Vice Chairman to Ben Mitu was equally seen smiling after the polls. He boldly said, "it was a good fight" and never seemed disappointed by the outcome of the polls. The journalists in the state council after the polls practically threw away their differences and gathered in a fanfare to unwind and celebrate their victorious colleagues. With this, politicians in the mainstream sector who might want to engage in sharp practices at any level of elections might have to rethink. This is because the journalists have already set the example that should be followed. They are now better positioned to sanction any misconduct because not only have they proved themselves clean enough for it, they have already set the pace which leaves no one with an excuse especially when it comes to the knowledge of the polity. It is therefore expected that come 2019 or anytime elections would be held at the mainstream politics level, the journalists will display high level of responsibility, justice, truth, fairness and fearlessness in the institution or influence of the right values. Thus, the entire citizenry should be the better for it given that their number one watchdog is alive and fully active to its responsibilities.